The drakkar was a type of Viking skeid, or longship, used for raiding and pillaging. Literally meaning "dragon," drakkars were unique in that their prows were ornately carved into the shapes of menacing beasts — from dragons to snakes to wolves, meant to both strike fear in the hearts of enemies as well as ward off the terrifying sea monsters of Norse mythology. 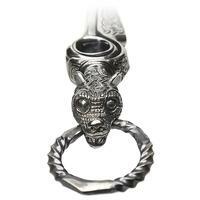 In this tamper of electroplated nickel and silver, Alexander Glotov has adorned the top with the head of an intricately patterned, wide-eyed wolf. 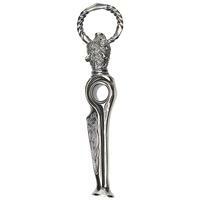 Clenched between its teeth is a handy ring, easily secured to a key chain or lanyard for safekeeping. 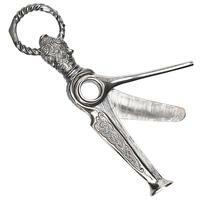 Below, then, a pick and scraper are easily accessed, unfolding from out of the body. I wouldn't recommend counting on it to keep you safe from mythological monsters, but I am confident it'll do quite well in service of all your pipe accessory needs.